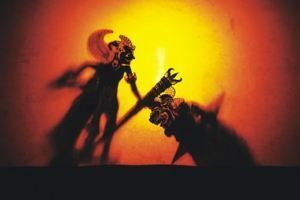 Wayang Kulit is a traditional theater art-form using puppets and shadow-play to tell the epic tales of the ancient classical Hindu legends, Mahabharata and Ramayana. The puppets are made of buffalo hide and mounted on bamboo sticks. There may be as many as 45 puppets – handled entirely by a single master puppeteer, known as the Tok Dalang. As a solo performer who representing all the heroes and heroines in the story, Dalang is the key of the performance – a masterly producer, conductor, puppeteer, historian, wise man, commedian, and the story-teller. Apart from this, Dalang also knows most of the music instruments meanwhile as the bomoh (Malay traditional practitioner). In the few hours of show, Dalang doesn’t only play the puppets, but also translates the voices of all the roles in the story apart from giving hints to the gamelan, sings and reads out loud. In some stories, the Dalang even uses ancient or classic dialect which in fact has long lost in the flow of time. He will breath new life into each re-telling of those ancient tales, continually reaffirming the currency and relevance of the harmony of life, the balance between antagonist and protagonist, giving a little homour, making the whole performance alive. Beside the usual story line, some good Dalangs react things that happen the day or make a joke as to cheer the audience. Atmosphere and the emotion of the hall are controlled and manipulated by the Dalang in his rising and falling voice. Sometime when it comes to an excited point, the hall could be in a tumult while come to the sadness plot, you might hear the sound of sneezing or see weeping eyes. To become a Dalang, one has to spend years to study the tradition of wayang kulit and trained by already professional. Most of the times this skills will stay in the family and will be thought from one generation to another. There is also people believes that some Dalangs do mystical practice in order to fight with the black magic that can be called in a show full of gods and demons. The hall is usually a small structure made of wood and bamboo. It is usually about 4 feet above the ground. The screen is called „kelir“ and is made of white cotton cloth. Shadow of the puppets is made by a lamp which is suspended from the roof behind the screen. The performance is accompanied by gamelan music, which is the traditional and also by the voices of the female singers, called pesindhen. A full wayang kulit performance will run about 8 hours, begins at 8 or 9 o’clock in the evening, and run through until down, in order not to be too tiring for the performers and the audience as well, it is normally divided into parts for a single story. Resulted from the introduction of the modern entertainment alternatives, like any other folk plays, wayang kulit is facing the predicament straits of dying out and fading from the people’s memory. Today it is played merely as culture performance in cultural center instead in a yard in the village.